FOR THE CHRISTIAN, all of life falls under the Lordship of Jesus Christ. This includes money matters. The Christian life has implications for the believer’s attitude toward wealth and poverty. It is not surprising, then, that economic matters are prominent in the teachings of the Bible and the social ethics of the Christian church. Turning to the Bible, we find a fundamental ambivalence regarding money. In some contexts, especially in the Old Testament, money is portrayed very positively. Abraham is described as “very wealthy in livestock and in silver and gold” (Gen. 13:2). Job was a man of great wealth, and Solomon was granted riches and honor unparalleled among the kings of his day (1 Ki. 3:13). Proverbs tells us that “the blessing of the Lord brings wealth” (10:22), and describes a simple work ethic: “A slack hand causes poverty, but the hand of the diligent makes rich” (10:4). Of course, the Old Testament is not without its warnings about wealth. We must not forget the source of our wealth: “Remember the Lord your God, for it is he who gives you the ability to produce wealth” (Deut. 8:18). We must not put ultimate trust in them. The Psalmist says that God will bring to ultimate destruction “the man who did not make God his stronghold but trusted in his great wealth” (Ps. 52:7). Further, the possession of wealth comes with the obligation to care for the needy: “He who is kind to the poor lends to the Lord” (Prov. 19:17). The O.T. institutions of the tithe, the Sabbath, and the Jubilee served in part to remind the Israelites that their wealth was ultimately the Lord’s and that they were to use it to his glory. The picture of money changes slightly in the New Testament, which emphasizes the breakthrough of the kingdom of God in the coming of Jesus Christ. Here the negative side of money receives greater emphasis. Jesus spoke often about money. In the parable of the rich fool (Lk. 12:19) he showed the folly of being materially rich but poor with God. He condemned the idolatrous attitude of treating money as a deity (Mammon): “No man can serve two masters. Either he will hate the one and love the other, or he will be devoted to the one and despise the other. You cannot serve both God and Money” (Lk.16:13). Jesus reminds us that money is God’s creation and is not to take God’s role of ruler of our lives; we must seek first the kingdom of God, and material things will be provided for us (Lk. 12:31). The possession of wealth too easily tempts us to a devotion for the things of this world, and away from Christ and his kingdom. Riches can choke the word and render it unfruitful in the parable of the sower (Matt. 13:22). For this reason, it is difficult for the rich to come to faith (Matt. 19:2324). The poor have an advantage, not simply because they are poor, but because they are unable to rely on their own resources and thus are more prepared to submit to Christ’s Lordship. For this reason Jesus blessed the poor (Matt. 5:3). These teachings of Jesus are reflected in the rest of the N.T. where we are warned (in what is perhaps the most well-known statement of Scripture on the subject) that “the love of money is the root of all kinds of evil” (1 Tim. 6:10). For Paul, the opposite of covetousness is contentment, and this is the foundation of his Christian life (Phil. 4:12). Finally, true wealth is to be found in our salvation in Jesus Christ, which is described often in Scripture in economic terms. The poor of this world have been chosen to be “rich in faith,” “inheriting God’s kingdom” (Jas. 2:5). Paul describes his ministry as “poor, yet making many rich, having nothing, yet possessing everything” (2 Cor. 6:10). Using zero-sum logic, he says that we are rich because Jesus became poor (2 Cor. 8:9). The biblical teaching on money is thus two-fold: money is a gift from God, a sign of his blessing. But it is not to be a god in itself. The Bible is not ascetic; poverty is not inherently virtuous, nor is wealth sinful. But true wealth, the Bible teaches us, is spiritual, not material. How has the biblical teaching on money been interpreted in the history of the church? The early church was generally poor itself. It taught a stoic indifference to the things of this world, in part because of its eschatological expectation of an imminent consummation of the kingdom. Gradually it developed a distrust of wealth and a glorification of poverty. But the early church was not communistic. The fathers recognized the tension between the affirmation of private property in Scripture and the radical demands of Christian love. They permitted private property and commercial activity, although they viewed both as post-Fall institutions and accommodations to man’s sinfulness, and so both were forbidden to the clergy. And they warned constantly about the dangers of wealth, instructing the rich to relieve the suffering of the poor through almsgiving. Private property was to be used for the good of others. Said Polycarp of Smyrna: “When it is in your power to do good, withhold not, because alms deliver from death." But they did not see the Bible as absolutely opposed to wealth. It was not the quantity of wealth that the Bible condemned but the wrongful attitude toward wealth. Augustine wrote in his commentary on Psalm 72 of how covetousness is a sin that tempted the poor no less than the rich: “It is not a matter of income but of desire. Look at the rich man standing beside you; perhaps he has a lot of money on him but no avarice in him; while you, who have no money, have a lot of avarice.” This idea is echoed in Clement of Alexandria’s sermon, “Who is the Rich Man that Shall Be Saved?” He argued that in Jesus’ parable, the rich man, who does not worry about his livelihood, may be less greedy, and thus closer to salvation, than the poor! We do not have to agree with his exegesis to affirm that the biblical warning against the love of money applies to both the poor and the rich. Generally, the church fathers concentrated on individual money matters, and did not address larger questions of economic justice. The notable exception to this was their very extensive condemnation of usury. The fathers were universally opposed to any interest-taking in the lending of money. The Old Testament prohibitions were regarded as binding (Deut. 23:19), and the New Testament teaching on love was seen as incompatible with usury ("lend without expecting to get anything back” [Lk. 6:35]). Athanasius taught that usury was a grave sin, commitment of which lost one his salvation. Ambrose agreed when he wrote: “If anyone commits usury, he commits robbery and no longer has life." In prohibiting usury the fathers especially sought to protect the poor. The poor were particularly inclined to borrow money, and greedy lenders often drove them to slavery or suicide. The fathers did not deal with the morality of interest in cases when the borrower himself profited from the loan. The medieval church further developed and institutionalized the Christian thinking about money. The ascetic movement of the ancient church found support in the nature-grace dualism in the thought of Thomas Aquinas. Money was viewed as unspiritual, the product of a fallen world. Wealth beyond the minimum for survival was subversive to true (anti-material) spirituality, and material poverty was necessary for spiritual perfection. Aquinas reflected the fathers’ antipathy toward commercial activity, finding “something base” in it, especially the practice of usury. In the middle ages we begin to see legislative attempts by the church to alleviate the problem of poverty. The practice of almsgiving was extended by medieval church councils into a quasi-income tax. Members of the church were required to pay a tenth of their income to the bishop, specifically to provide relief for the poor. The Reformation rediscovery of the doctrine of justification by faith had an important impact on its interpretation of economic matters. The Reformers rejected the glorification of poverty. Monastic movements that began as works of charity had become means of seeking salvation. Justification by faith taught that salvation is the foundation, not the goal of the Christian life. There was therefore no salvific value in being poor or in giving alms. The Reformers did not deny the biblical warnings about wealth (Luther saw three conversions necessary for the believer: conversion of the heart, the mind, and the purse). But neither did they recommend material poverty. Calvin wrote that poverty is as dangerous to spirituality as wealth: “From the right are, for example, riches, powers, honors, which often dull men’s keenness of sight by the glitter and seeming goodness they display, and allure with their blandishments, so that, captivated by such tricks and drunk with such sweetness, men forget their God. From the left are, for example, poverty, disgrace, contempt, afflictions, and the like. Thwarted by hardship and difficulty of these, they become despondent in mind, cast away assurance and hope, and are at last completely estranged from God." The Reformers also rejected the Thomistic anti-materialism that lay behind the medieval rejection of wealth. Aquinas taught that money was a post-Fall institution, but Calvin regarded money more positively as an institution of creation. It was part of the “order of nature,” a vehicle to enhance human communication. Wrongful use of money, therefore, was a corruption of the order of nature. Calvin is the first theologian to question the scholastic teaching on usury. He found the absolute prohibition against interest to have more affinity with an Aristotelian view of money than with the biblical witness. Money was not a static unit of exchange (as Aristotle held), but a dynamic tool for the creation of wealth. Because borrowers could profit from loans, the rationale against usury weakened. But Calvin fell short of full endorsement of usury. He distinguished lawful and unlawful usury. Unlawful was the practice of the professional usurer, who invariably oppressed the poor. Such should be banned from the church, urged Calvin; “We should not grow rich at the loss of others.” But usury was lawful, indeed necessary, in commercial contexts. The Reformers saw no incompatibility between commercial activity and the Christian life. Calvin simply insisted that the Golden Rule govern such activity. Wesley urged believers to practice business to the glory of God: “Make as much as you can, save as much as you can, and give as much as you can." Is it not sad and intolerable hypocrisy that these poor people boast of having the Word of God, of being the true, Christian church, never remembering that they have entirely lost their sign of true Christianity? For although many of them have plenty of everything, go about in silk and velvet, gold and silver, and in all manner of pomp and splendor, ornament their houses with all manner of costly furniture; have their coffers filled, and live in luxury and splendor, yet they stuffer many of their own poor, afflicted members to ask alms; and poor, hungry suffering, old, lame, blind, and sick people to beg their bread at their doors. For Simons, the gospel carried a radical obligation for the care of the poor; “Whoso hath this world’s good, and seeth his brother have need, and shutteth up his bowels of compassion for him, how dwelleth the love of God in him?” (1 Jn. 3:17) . Most Anabaptists permitted private ownership, but some Anabaptist sects went so far as to renounce private property. A Christian communism was institutionalized by the Hutterites in their practice of a “community of goods.” The words of Ulrich Stadler reveal how destructive possessions were to the Christian life in the eyes of these Christians: “one, common builds the Lord’s house and is pure; but mine, thine, his, own divides the Lord’s house and is impure. Therefore, where there is ownership and one has it, and it is his, and one does not wish to be one with Christ and his own in living and dying, he is outside of Christ and his communion and has no Father in heaven." But the Anabaptists were a persecuted minority, and their influence was limited. Meanwhile, the economic legacy of the Reformation was carried to the new world by the Puritans. The Puritans pursued an ethic of industry, moderation, and simple living. Ironically, this ethic tended to produce great wealth. 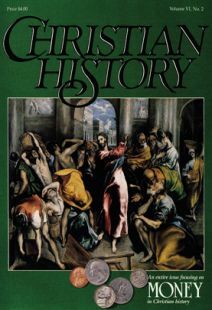 The similarities between the Puritan work ethic and the business ethics of capitalism prompted sociologist Max Weber to forward the thesis that the theology of the Reformation, especially Calvinism, gave rise to capitalism. In his famous work, The Protestant Ethic and the Spirit of Capitalism he argued that the Calvinist virtues of frugality, honesty, and thrift produced a “this-worldly asceticism,” replacing the medieval “other-worldly asceticism,” and generated an accumulation of wealth. Weber’s thesis is compelling, but Calvin himself warned against seeing wealth as an automatic sign of God’s election. We ought not to probe into the mysteries of God’s providence. After all, by his common grace God does grant riches to the heathen. The Puritans likewise saw nothing inherently meritorious in wealth; it was often viewed with great suspicion. Richard Baxter warned that “where the world hath got possessions in the heart, it makes us false to God, and false to man, it makes us unfaithful in our callings, and false to religion itself.” The Puritans were keenly aware that riches could turn one from God. Commenting on the materialism of his day, Cotton Mather wrote: “Religion begat prosperity and the daughter devoured the mother." Critics of Weber are thus uneasy about finding a legitimization of capitalism in Calvinism; some see an opposite correlation between the rise of capitalism and the decline of Calvinism. In the Post-Reformation era capitalism secularized Calvinistic ethics. Protestantism became synonymous with middleclass respectability, and Christian virtues with bourgeois values. The Post-Reformation era abandoned the social revolutionary thought of the Reformers. Rather than seek the structural solutions to poverty that characterized the Reformation, Protestantism returned to the early church model of personal charity. Protestant mission efforts to ameliorate the economic victims of industrialization generally did not aim at structural change in society. For American evangelicals, the problem of poverty is tied to the question of relating evangelism and social action. In the 19th century, the evangelical benevolent empire in America saw no conflict in the church engaging in both activities. Historian Timothy Smith argues that reform-minded evangelicals successfully united spiritual and social concerns: “The soul-winning impulse drove Christians into systematic efforts to relieve the miseries of the urban poor.” By the turn of the century, however, pessimistic premillenialism saw social reform as a lost cause. Charity again became privatized, and the emphasis in the churches returned to evangelism. Dwight L. Moody, for example, saw individual conversions as the greatest hope for social change. Since the middle of this century, evangelicalism has shed the indifference to social action characteristic of fundamentalism, but debates continue on how the church best addresses poverty and other social issues. In contemporary Christian discussions on economic issues, much attention is focused on the structural roots of wealth and poverty. Some contemporary writers, renouncing the traditional concern for the attitude toward wealth, find the mere quantity of wealth to be sinful in a world of growing disparity between rich and poor. The dislocating effects of industrialization, the impoverishment of the third world, and the coarse hedonism of Western consumerism have led those to seek solutions to poverty in redistribution. Walter Rauschenbusch and his Social Gospel movement attempted to reform laissezfaire capitalism of 19th-century America by placing economic structures under the “law of Christ” rather than the “law of Mammon.” His vision was to usher in an era of economic justice marked by just wages, lower unemployment, and redistributed wealth. More recently and more radically, liberation theology has located the source of third-world poverty in Western affluence. Liberation theology does not regard money neutrally. It holds that money can take on demonic character, and is one of the “principalities and powers” of darkness at war with God’s kingdom. Thus the rich are the world’s oppressors, and the biblical episodes of the Exodus and the Incarnation (Lk. 4) provide models for revolutionary action: God acting decisively in dislocating the powerful and liberating the poor. Many liberation theologians condemn private property, and they are generally utopian in their visions of a society where the ethics of the kingdom overcome human selfishness. While the social gospel and liberation theology would recommend socialistic economic arrangements, another stream of current thought advocates an “alternative liberation theology” in democratic capitalism. It finds flaws in a negative attitude toward money and in the zero-sum presuppositions of redistributionism (the poor are poor because the rich are rich) It cites the virtues of productivity and the success of capitalist societies in raising standards of living, and it finds hope for the poor in the creation of new wealth. Thus this school of thought prefers models of development rather than liberation. And it regards the vision of liberation theology as unrealistic: the best Christians can hope for in this world is not the eradication of selfishness but the control of selfishness. The current debate and the tensions in the history of interpretation remind us of the two-fold character of the biblical witness on money. Money is a blessing from God, but the love of money is sinful. In personal attitudes toward wealth, these two ideas are harmonized in the biblical concept of stewardship. Stewardship welcomes money as God’s gift, but remembers that our property is ultimately God’s. We are entrusted with it for a time and we will be held accountable for our use of it. The southern Presbyterian theologian Robert Dabney wrote that stewardship requires the Christian to make the most efficient use of wealth: “It is our duty to make the best use of every part of our possession that is possible in our circumstances. If there was any way within our reach in which our money might have produced more good and more honor to God when we spent it in something innocent, but less beneficial to his service, we have come short of our duty. We have sinned.” Dabney offers a simple test to judge our use of God’s money: Does it make us more efficient servants of God? John R. Muether is librarian at Westminster Theological Seminary, Philadelphia, PA.